Vege PRO-7 has been specially formulated with 7 organic proteins, 1 amazing taste and nothing artificial. It features super foods like organic bio-fermented whole grain brown rice, organic sprouted chia, organic Canadian hemp protein, organic pumpkin seed and other nutrient-dense proteins. It's everything you're looking for in a plant-based protein supplement with no added artificial colours, sweeteners or flavours. Vege PRO-7 is also formulated without wheat, soy, dairy, egg, gluten or pea making it more easily digestible and suitable for men and women of all ages. It's made from only natural whole food ingredients that you can feel good about enjoying on a daily basis. Getting enough protein is always a concern when you're not consuming animal products. Vege PRO-7 takes out the guesswork and offers a delicious solution for anyone looking to add more protein to their diet. We developed Vege PRO-7 to provide a clean source of fuel for those who want to eat vegetarian, avoid common food allergies or with other dietary restrictions, making it simple to get the nutrition you need. Not only that, it tastes so good you'll actually look forward to drinking it every single time! Whether you enjoy it as a pre-yoga snack, in a post-workout shake, in your morning smoothie, or simply whenever you need a convenient all-natural energy boost, you'll know you're getting the quality nutrition you need to support your active lifestyle. With Vege PRO-7 you'll be feeling great, looking great and resting easy knowing you're providing your body with the nutrition it craves without any artificial ingredients. 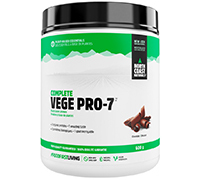 Vegan athletes or anyone living a healthy and active lifestyle will find Vege PRO-7 to be a welcome addition to their nutrition and supplement program. With Vege PRO-7 you can train at intense levels while providing your body with the nutrition it needs to recover. It's low in fat, cholesterol and sodium, and high in fibre, protein and essential fatty acids. It's also naturally rich in vitamins and minerals and a complete protein containing all 9 essential amino acids. All of which make Vege PRO-7 perfect for anyone and any lifestyle, not just for vegans and vegetarians. Although Vege PRO-7 tastes amazing just mixed with water, it can also be used to boost the nutritional profile of smoothies, baking and other recipes. With 2 amazing flavours to choose from either one will add a subtle, sweet flavour to your favourite recipes. It's highly versatile and can be added to a variety of recipes such as muffins, homemade protein bars or even mixed into oatmeal. It mixes easily with water or with your favourite non-dairy milk, with no blending required for a smooth, creamy texture and just the right amount of sweetness. Every time you drink Vege PRO-7 you'll be amazed at how something so healthy can taste so good! Every member of the family can enjoy these 2 great tasting, plant-based organic protein shakes.